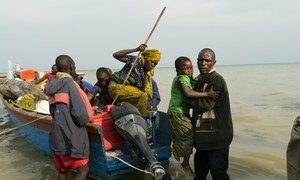 The United Nations Security Council on 10 April 2018 called for an end to the recurring cycles of violence and instability in Africa’s Great Lakes region, as a senior UN official reported that some armed groups are continuing attacks on civilians in the Democratic Republic of the Congo. UN Photo/Eskinder Debebe | Said Djinnit, Special Envoy for the Great Lakes Region, briefs the Security Council on the situation in the Great Lakes region. In today’s briefing, Djinnit told the Council that while implementation of this accord, formally known as the Peace, Security and Cooperation Framework, has been slow and requires greater political will, it remains a vital tool to bring stability to the region. The accord was signed by 11 countries, namely Angola, Burundi, the Central African Republic, the Republic of Congo, the DRC, Rwanda, South Africa, South Sudan, Tanzania, Uganda and Zambia. The UN, the African Union (AU), the International Conference on the Great Lakes Region (ICGLR) and the Southern African Development Community (SADC) act as guarantors of the accord. In early 2014, Kenya and Sudan became the 12th and 13th signatories of the accord, respectively. (SOURCE: UN).